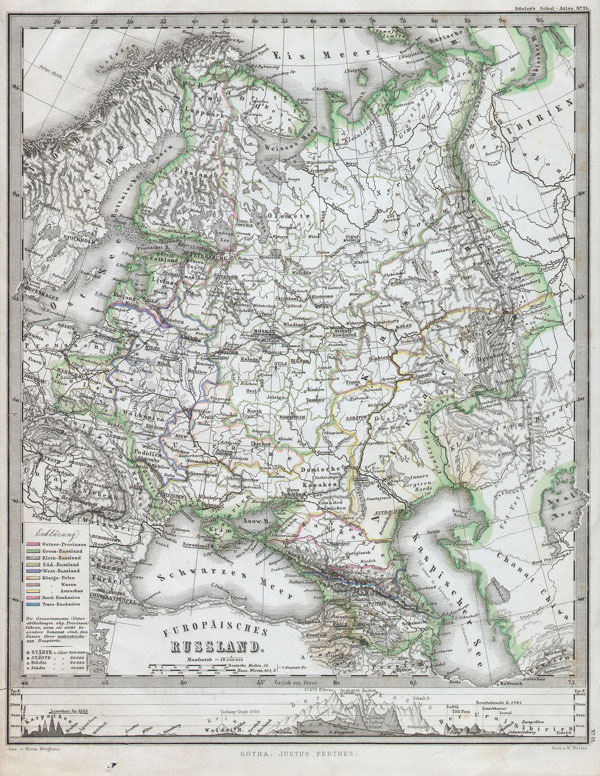 This fascinating 1862 map by Justus Perthes and Stieler depicts the European part of Russia. In a cartographic flourish unique to Perthes, the bottom of the map is adorned with a elevation profile chart. Unlike other cartographic publishers of the period, the Justus Perthes firm, did not transition to lithographic printing techniques until the early 1870s. Instead, all of his maps are copper plate engravings and hence offer a level of character and depth of detail that was impossible to find in lithography or wax-process engraving. All text in German. Issued in the 1862 edition of Stieler's Schul-Atlas.